Divisions (also known as classes or age groups) are ways of separating competitors/groups. Divisions could be age groups (4-8, 9-12, 13-18, etc.) or could be by school size (small, medium, large, etc). *In order to create a new division, you first need to Create an Organization. If you haven't created an organization, please follow the directions here. You will need to set up your organization's divisions in the system BEFORE you can create your groups. If you attempt to create a group first, the system will give you the warning box below. If you see this box, just click on the link inside the box to start the division setup process. 1. Under your organization's Settings tab, click on Divisions under the Standard Setup menu on the left-hand side. 2. Click on Create a Division. 3. In the pop-up box, enter your division's name, initials, and interval time [The interval is the number of intervals (configured per division) to add (or subtract) from the following schedule entry]. There are additionally 3 tabs with information to enter for your division: Score systems, Recap, Advanced. In the Score systems tab, you will see the scoring system that you already created previously. 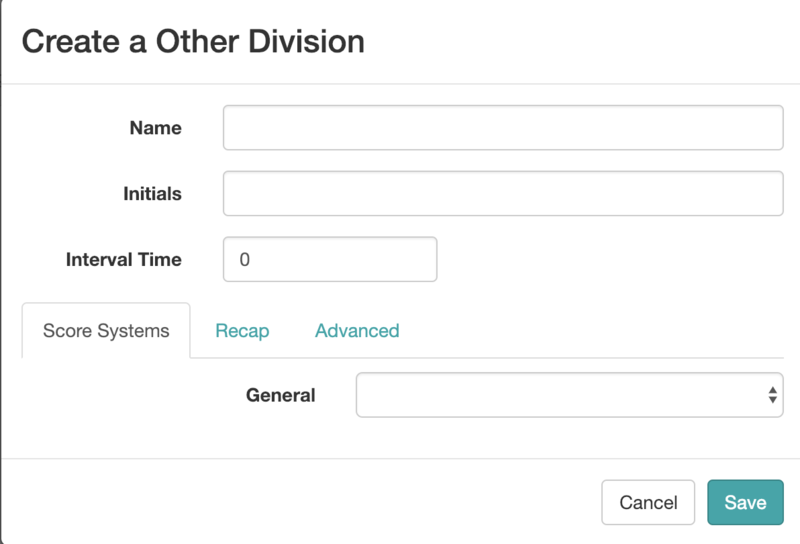 If you don't have any scoring systems in the drop-down box, you'll need to create one. You may see additional drop down options of existing systems provided by CompetitionSuite. 4. You will now see the division listed, along with interval time. To continue adding divisions for your event, click on Create a Divison.